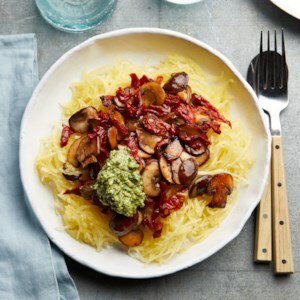 Find healthy, delicious vegetarian Mediterranean recipes, from the food and nutrition experts at EatingWell. 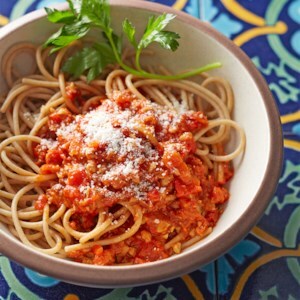 Originating from the Catalonia region of Spain, "salsa romesco" is a tomato sauce made with nuts and peppers. 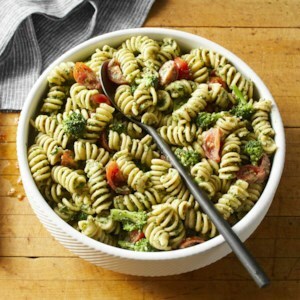 It's traditionally eaten with fish, but in this recipe we pair it with whole-grain pasta for a yummy vegetarian meal. Parmesan is our choice for cheese, but you can substitute Pecorino Romano or Manchego cheese if you'd like. 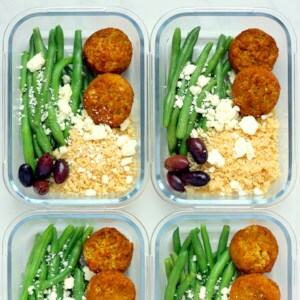 These quick Mediterranean-inspired couscous bowls come together in 20 minutes thanks to healthy convenience items like frozen falafel and steam-in-bag fresh green beans. 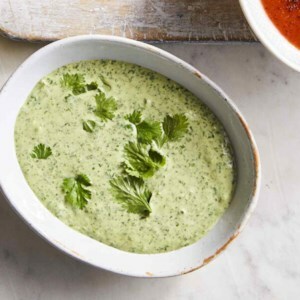 Whisk together the simple tahini sauce while the other ingredients cook. 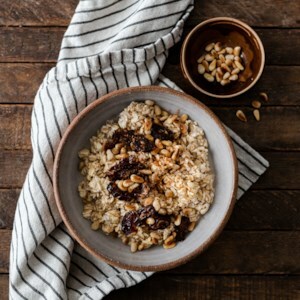 Chopped dates, honey and cinnamon provide natural sweetness to these overnight oats, and pine nuts balance each bite. 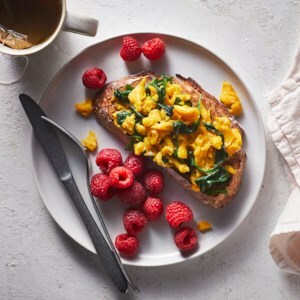 With just a bit of work before bed, you can have a fast but decadent breakfast in the morning. These overnight oats "cook" while you sleep. 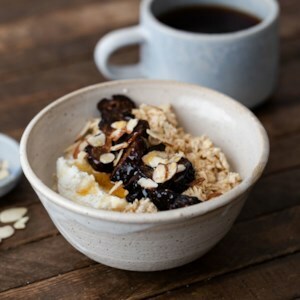 Toast almonds and chop figs the night before, so that when you rise, you can just stir in the fruit, nuts, honey and ricotta cheese for a hearty, sweet and creamy breakfast. 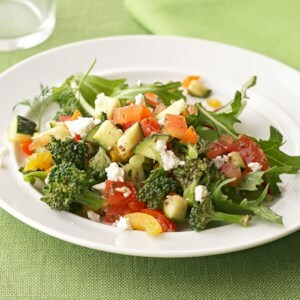 Chopped vegetables take on a Mediterranean flair in this quick and easy salad recipe. Flavored with a simple pesto vinaigrette and topped with crumbled feta cheese, this salad serves two and is ready in just 20 minutes. 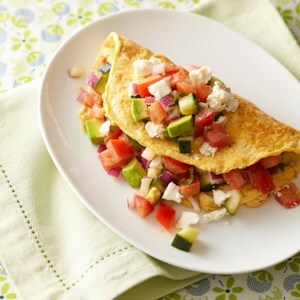 These omelets are chock-full of a fresh vegetable salsa, made with tomatoes, cucumber, avocado and fragrant herbs. Make the salsa ahead and your breakfast will be ready even sooner! 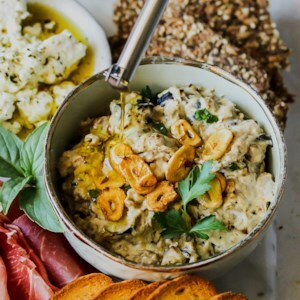 Homemade yogurt cheese is the trick to this make-ahead party dip featuring feta cheese and zesty Mediterranean flavors. 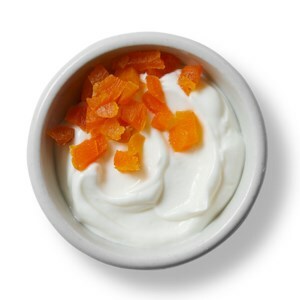 To make yogurt cheese, just drain yogurt of excess whey before use. 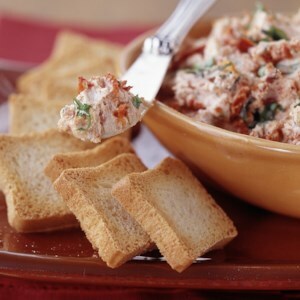 The delightful flavors of goat cheese and dried tomatoes make a spread that's perfect on crackers for an appetizer or a snack. 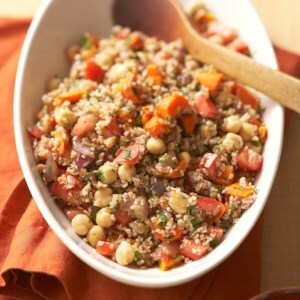 This classic vegetarian salad is loaded with vegetables, bulgur and chickpeas. Our suggested serving size is 1 1/2 cups, but feel free to cut that in half to serve more people or to make the dish last longer. 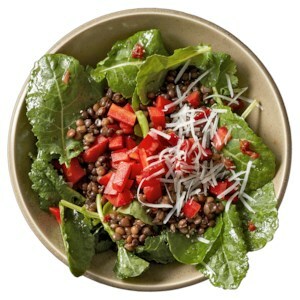 The kale and lentils in this Mediterranean-inspired salad recipe are combined with sweet red peppers and a bold garlic and dried tomato vinaigrette. To cut down on prep time, we use refrigerated steamed lentils, but offer instructions on preparing your own. 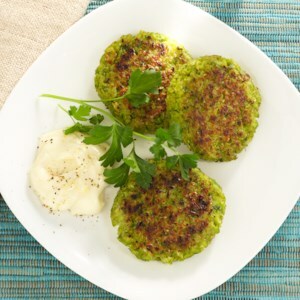 A twist on the classic chickpea falafel, these tasty edamame falafels will not disappoint! When you're craving something crunchy between meals, try this Balsamic Cabbage! 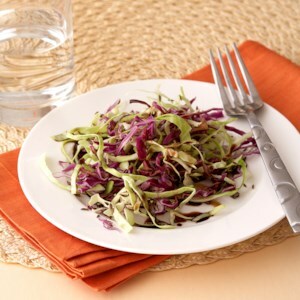 Add flavor to raw cabbage with caraway seeds, dill weed, parsley, or curry powder. Plus, each herb or spice counts as a free food in the small amounts used to season foods. 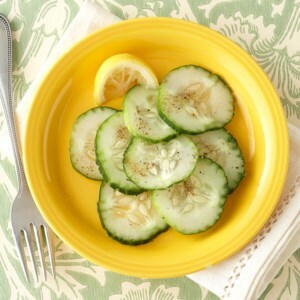 When you need a refreshing low-calorie snack, nibble on these Lemon-Pepper cucumbers for just 8 calories and 2 grams of carb. Plus the lemon juice and black pepper count as free foods! These healthy multi-grain wraps are filled with mixed greens, chopped cucumber, tomato and red onion, as well as feta cheese and a homemade cilantro hummus. 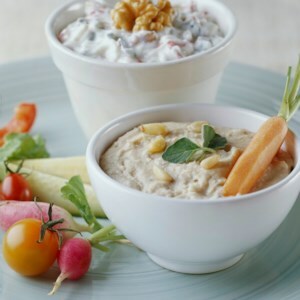 As a time saver, the hummus can be prepared up to 3 days ahead, and chilled until you're ready to make the wraps.